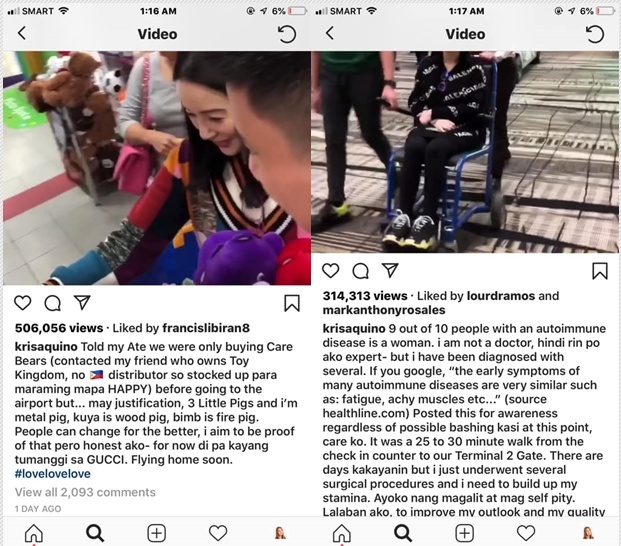 Netizens took to social media as they slammed and exposed Kris Aquino's alleged drama as she was earlier seen shopping in Singapore but when she arrived in the Philippines she was seen seating in an airport wheelchair. Prominent social media personality and blogger Krizette Laureta Chu shared some screenshots of Kris Aquino's Instagram account as she lambasted the controversial sister of former Pres. Noynoy Aquino. Krizette Chu was quoted as saying "Lol. Nakapag shopping ng naatayo pero yung nasa airport na, naka wheelchair na. VERY LP. Mga one day lang ang pagitan. Nakakaloka. May naniniwala pa ba dito." Krizette stated. 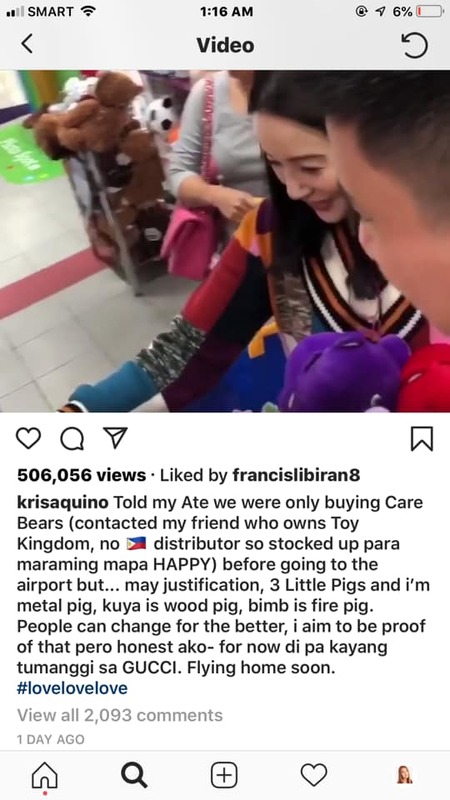 In the first Instagram post of Kris Aquino, she was seen shopping in Singapore as she noted that they were buying Care Bears and flaunted that the owner of Toy Kingdom in the Philippines is her friend who admitted that there's no stock of the said items in the country, so she bought plenty of it to make some people happy. Aside from shopping in Singapore, Kris was able to showcase according to some netizens her endorsement of products such as To Kingdom and GUCCI. 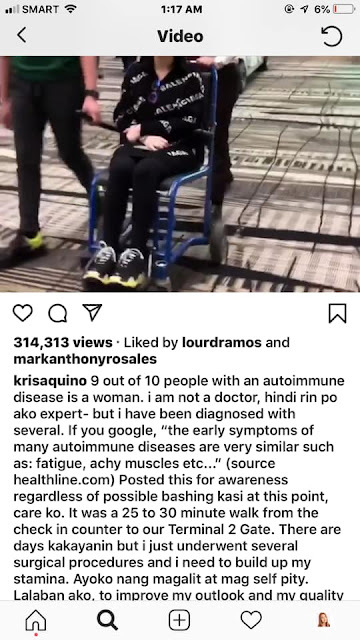 In the next Instagram post of Kris Aquino, she was seen in a wheelchair during her arrival at the NAIA Terminal 2 despite the fact that there's an available walkalator according to some netizens. Rosalinda Vetter: I google nyo daw. It means nag google muna sya para alam nya na kung ano ang sakit-sakitan nya. Jevie Tan Nery: Surgical procedures? Diva blood test lang Yun, aheyyyyy atik pa more. Emil Sanchez Maranan: 25 to 30 mins walk? Kalokohan! May mga walkalator ang changi...within 10 mins kaya makarating sa gate mo! Super exaggerated ka as in! Sandra Salazar: Kung baby walk ka aabutin ka nga ng 30mins. Puro walkalator kaya dyan sa T2. Cherry Cular-Tagadan: When you truly have an auto-immune disease, you try to hide it to look normal, avoid getting looks from other people, and get unnecessary attention and special treatment. When there are posts about it, it’s about showing strength and a photo of looking strong. Also, some sufferers of auto-immune diseases even decline to get a PWD ID, even if their doctor has offered it, because they feel like other people who have worse conditions deserve it more. From experience lang. just my 2 cents. Krizette Laureta Chu: si Bimby ginawa nyang best friend kasi wala syang friend na nagtatagal sa kanya. kawawang bata. i hope he grows out of her shadow. Or he'll be a character in a Danielle Steele or Jackie Collins novel. Andre Joseph Marcos Pareja: When you don't even bother using a more credible web source for your illness and what "surgical" procedure?? * us Doctors: "are we a joke to you?"